You knew it was eventually coming… a Twitter lawsuit. 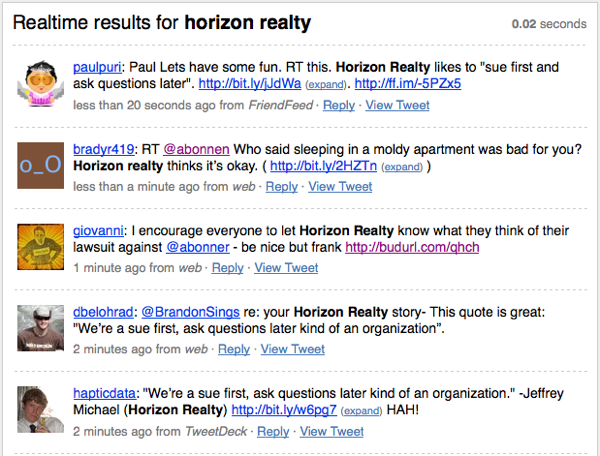 In the times where anyone will sue you for anything it seems, Horizon Realty Group is taking a Twitter user to court over a simple tweet. It should also be made clear that Bonnen had only 20 followers — that is, before she closed her Twitter account. She is being sued for $50,000, according to ChicagoNow.com. This is definitely a company that does not know how to embrace social media or use it to their benefit. Most companies today welcome criticism and complaints as a way to improve themselves. Southwest Airlines for example responds personally to tweets from passengers who may or may not have enjoyed their flight for a particular reason. This just goes to show that corporate America has a lot to learn about how to handle the Internet, especially freedom of speech when it comes to the public’s opinion. This is just an awful mistake from Horizon Realty. I wonder why no one stopped them along the way to sue someone for this. I saw the news about this on Mashable and was shocked. They not only missed a great customer service opportunity, but now have gotten 1,000 times more negative press than they would’ve if they just let the issue go. I can’t believe that such a tweet could cause so much trouble.